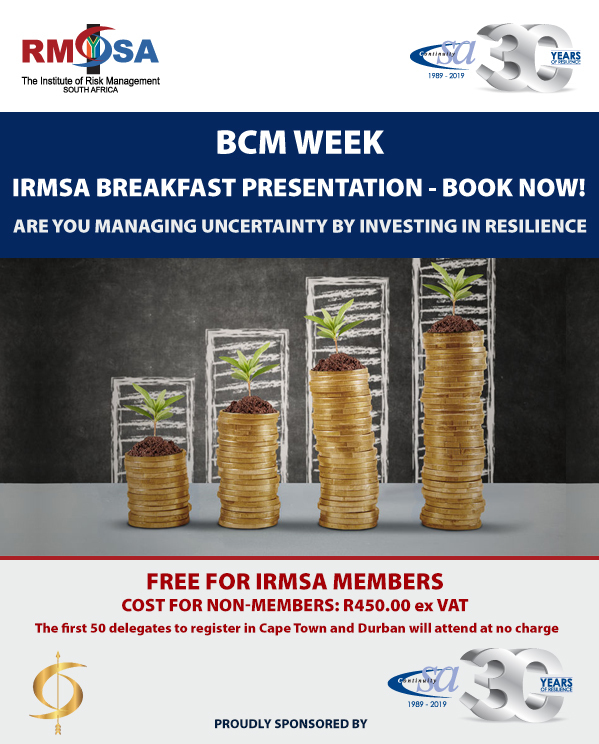 Attendance of the IRMSA Breakfast Presentations is free for IRMSA Individuals, Associates and Fellow Members. IRMSA Corporate Members may register as many delegates as the number of “Corporate Additional Representatives” their membership entitles them to. Should this be unclear, please contact IRMSA for clarification. Corporate Member organisations may register additional delegates at a cost of R400.00 (ex VAT) per delegate. Cancellations must be emailed to events@irmsa.org.za no later than 3 working days prior to the event. If a cancellation is not received or if a delegate is a “no show”, a cancellation fee of R450.00 (ex VAT) will be charged. Substitutions are welcome.